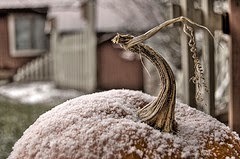 hearth/myth: Seasons: Halloween in Michiana. “Maybe it’s the best idea,” Ms. Elsie replied quietly. The conviction in her voice gave Julia the courage to step into the labyrinth. At the moment her toes touched the path inside the ropes, everything changed. We've established that I'm old, right? When I was growing up in Michiana, trick-or-treating was an actual thing. We would get dressed up in our costumes and traipse around to the neighbors and hold out our little buckets or bags, and they would give us candy. It wasn't until I was a little older that people started getting spooked by stories of razor blades in apples and the like. And then came the stories about crazy, trippy people handing out drugs instead of candy, and, well, that's when most parents instituted the practice of checking over one's haul and tossing out anything that wasn't wrapped. Urban myths die hard. Just last week, I opened a bag of miniature Milky Way bars and found one that had missed the wrapper machine at the factory. I debated whether to throw it out. But it was in a factory-sealed bag and it didn't look like anyone had injected anything into it, so I ate it. So far, I'm still here. The thing I remember most about trick-or-treating in Michiana was it was cold. Late October near Lake Michigan is not for the faint of heart. My mother used to buy my Halloween costume a size bigger than normal, because it was pretty much guaranteed that I'd have to wear my winter coat under it. And yes, sometimes we would already have snow by Halloween; I remember stepping over snowbanks to get to people's doors. I have a confession to make, and it's in relation to this: A few days ago, advice columnist Prudence posted a letter from a woman who complained that poor kids were getting all her good candy. "Halloween isn’t a social service or a charity in which I have to buy candy for less fortunate children," the sniffy woman said. "We already pay more than enough taxes toward actual social services." Prudie, bless her, shut her down. "Stop being callous and miserly and go to Costco, you cheapskate," she said. I wanted to stand up and cheer, because I was one of those 99-percent kids who would go trick-or-treating in better neighborhoods to get better candy. I mean, come on -- it's common sense. Who wouldn't rather get a bunch of candy bars than a bagful of Smarties? Ms. Cranky One-Percenter, I have the perfect solution for you. Next year, band together with your neighbors and get everybody to agree to hand out nothing but Necco wafers and Laffy Taffy. I guarantee that the following Halloween, your neighborhood will be a ghost town for real. Partly to take my mind off the Kindle Scout thing, I'll be out and about this month. Next weekend, I'm attending the World Fantasy Convention. I'm doing a reading (from Seasons, natch) on Saturday the 8th at 3:30pm. If you're planning to attend WFC this year, I hope you'll stop by. The following Saturday, which would be Nov. 15th, I'll be in New York to attend the Self-Publishing Book Expo. I'm not speaking or reading, but I'm looking forward to sitting in on some panels and learning some new stuff. And as a thank-you to you guys for putting up with me this month, I'm running a contest to give away a Kindle HD6. If you win, I'll even let you pick the color. The entry form is below; if it doesn't work for you, try using a different browser than Internet Explorer. These moments of bloggy nostalgia have been brought to you, as a public service, by Lynne Cantwell.